and your integrative approach to medicine? A. I graduated from the University of Illinois college of Veterinary Medicine in 2005. 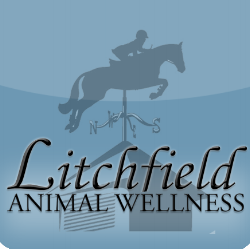 Upon finishing vet school, I completed a one year internship at a large sport horse practice in Connecticut. It was during this internship that I had my first exposure to acupuncture and chiropractic and it’s use in the performance horse. I had always been intrigued by the alternative therapies, but it wasn’t until 2009 that I was able to begin my journey of training and certification in both modalities. I am a scientist by nature and I still believe in the importance of veterinary medicine. But I am now able to offer clients and their pets a natural option for treatment integrated with traditional veterinary care. Most of my clients come to me when their regular vets have used all the tools in their toolboxes. I offer a few more options to improve the quality of life of my patients. Q. Who are your patients? A. The most common pet that I treat is the senior dog with hind end weakness and arthritis. I also commonly treat patients with skin conditions, GI disturbances, paralysis, anxiety, incontinence, and seizures. My goal is to increase the pet’s quality of life and comfort for as long as possible. new concept. Have you seen an increase in the demand for these services in our community? A. I have definitely seen an increase in demand for these services. Veterinary medicine as a whole is much more accepting of integrative medicine. Vet students can now have exposure to these modalities in school. It is an added bonus that I make house calls because traveling to the vet hospital is very difficult for a number of patients, either because of mobility issues or anxiety. offering is so important to you. A. I recently lost a very special person in my life, my grandfather. It wasn’t until this experience, that I truly appreciated how lucky I am that I get to help my patients when their quality of life has diminished and they can no longer do the things that they once loved to do. And now, I can provide this service surrounded by the people who love them most, in their own home, on their favorite couch, or in their favorite spot in the yard. This eliminates any stress and anxiety that is associated with the veterinary hospital. One of the hardest parts is letting them go when it is time, but it is rewarding to know that you have given them a loving and peaceful end of life experience. Q. What is the best advice you can give someone who is trying to make some healthy changes for their beloved pet? A. I recommend talking with your regular veterinarian about an integrative approach to veterinary medicine. 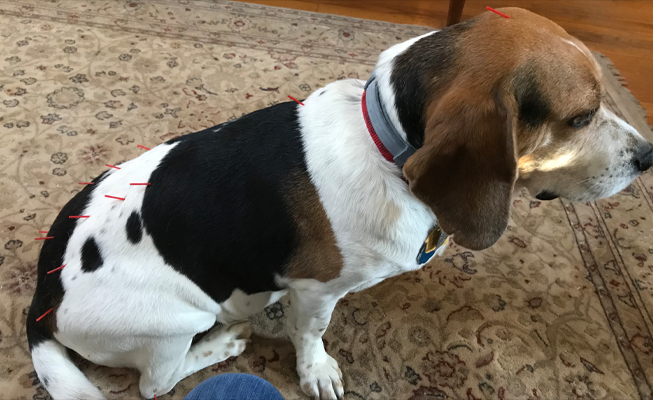 Routine acupuncture and chiropractic can help diminish the need for sick visits and in my opinion, should be part of the wellness care plan of all pets. Please make sure you choose someone who is trained and certified.